Single-Port Access Surgery (SPAS) is the latest innovation in minimal invasive surgery. Advantages of SPAS over standard laparoscopic surgery include faster patient recovery, decreased peri-operative pain and further improvement in cosmetic results. The challenge of SPAS is attributed to the coaxial arrangement of the instruments that requires certain technical skills and manual dexterity different to that of standard laparoscopic surgery. There is lack of knowledge in relation to the influence of various Single Port Access Surgery (SPAS) ports on the surgeon’s operating performance. The technical challenge involves instrument crowding, loss in depth perception when the camera lines up with the shaft of the working instrument and the loss of triangulation. These effects could be measured in terms of basic laparoscopic skills such as, hand-eye coordination, depth perception, ambidexterity and complementary bi-manual skills. 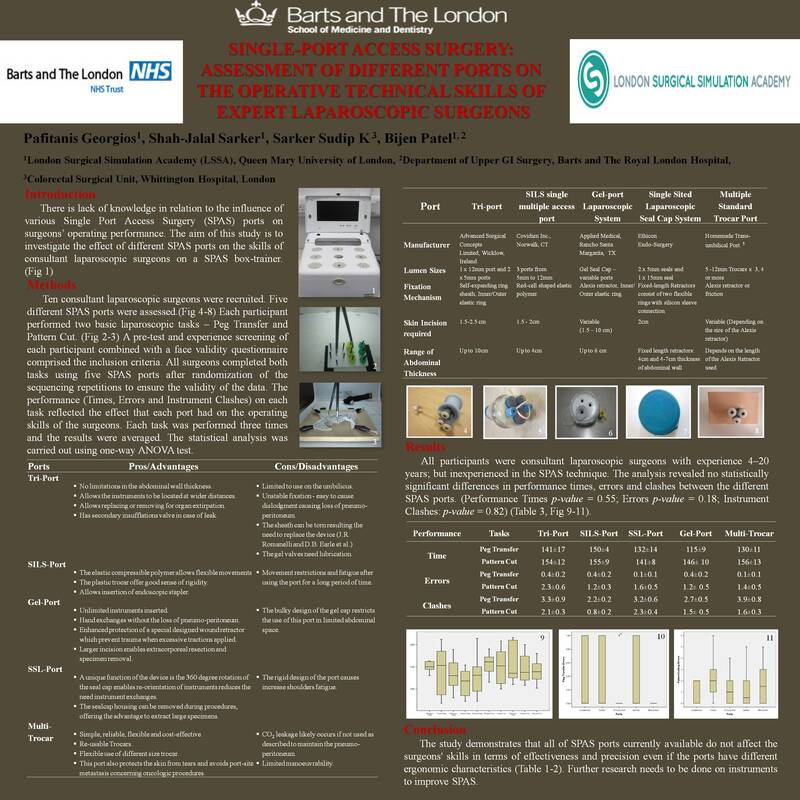 The aim of this original study is to investigate the effect of different SPAS ports on the skills of consultant laparoscopic surgeons on a SPAS box-trainer. Ten consultant laparoscopic surgeons were recruited. Five different SPAS ports were assessed. (Tri-port or R-Port – Advanced Surgical Concepts Limited, Wicklow, Ireland, SILS single multiple access port – Covidien Inc., Norwalk, CT, Single Sited Laparoscopic Seal Cap System – Ethicon Endo-Surgery, Gel-port Laparoscopic System – Applied Medical, Multiple standard Trocars). Each participant performed two basic laparoscopic tasks from the fundamentals of laparoscopic surgery (FLS) program– Peg Transfer and Pattern Cutting. A pre-test and experience screening of each participant combined with a face validity questionnaire comprised the inclusion criteria. All participants underwent an initial demonstrating session to secure the baseline of the study. All surgeons completed both tasks using five SPAS ports after randomization of the sequencing repetitions to ensure the validity of the data. The performance (Time, Errors and Instrument Clashes) on each task reflected the effect that each port had on the operating skills of the surgeons. Each task was performed three times and the results were averaged. Data were entered in an SPSS version 14.0 database for analysis. The statistical analysis was carried out using one-way ANOVA test. All results were presented as mean ± standard error of the mean with the p-value<0.05 to be considered as statistically significant. All participants were consultant laparoscopic surgeons with experience of 11.8 ± 5.2 (4–20) years. The analysis revealed no statistically significant differences in performance time, errors and clashes between the SPAS ports. (Peg Transfer, Time: F4.45 = 0.771, p-value = 0.55; Errors: F4.45 = 1.636, p-value = 0.183; Clashes: F4.45 = 0.378, p-value = 0.823, Pattern Cutting, F4.45 = 0.480, p-value = 0.752; Errors: F4.45 = 0.776, p-value = 0.547; Clashes: F4.45 = 0.776, p-value = 0.547). The study demonstrates that the majority of SPAS ports currently available do not affect the surgeon’s manual skills in terms of effectiveness and precision even if the ports have different ergonomic characteristics. Further research needs to be done on instruments to improve SPAS.